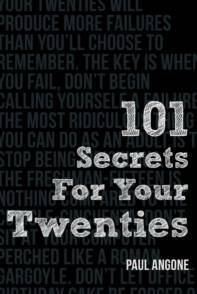 I recommend Paul’s book, 101 Secrets For Your Twenties , for anyone entering or in the first half of their 20s. The book is filled with great advice on how to approach everything from career to dating to chasing your dreams and keeping the right attitude so you can navigate those waters of being a new adult. It would make a great gift for college graduation or a 20-something birthday. Paul states in the book that he intends for it to be a “conversation starter and instigator to prompt us to think, speak, and believe differently about our lives.” I think the book achieves that – and does so by backing up his wisdom-filled “secrets” with witty, often laugh-out-loud supportive detail. An example of some of the great “secrets”: 1) A college diploma is NOT your golden ticket into DreamJobLand. It’s merely your pinky toe in the door. 2) Failure means you’re simply finding a more profound way to be successful. 3) In the working world, very rarely is someone waiting there to teach you how to do your job. They’re expecting you to teach yourself. 4) The biggest risk of your 20s would be never taking any risks at all. You can click the book’s image above to pick up a copy at Amazon! Enjoy.